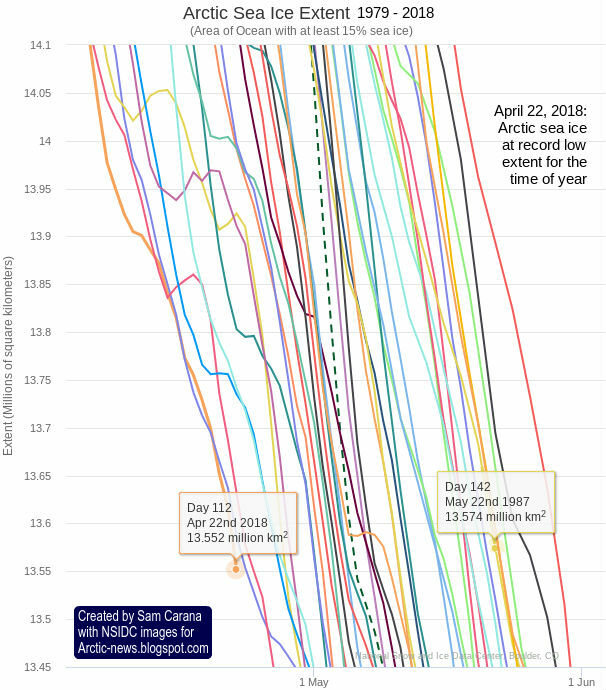 On April 22nd, 2018, Arctic sea ice extent was only 13.552 million km², a record low for the time of year. In 1987, by comparison, sea ice extent wasn't below 13.574 million km² even on May 22nd. 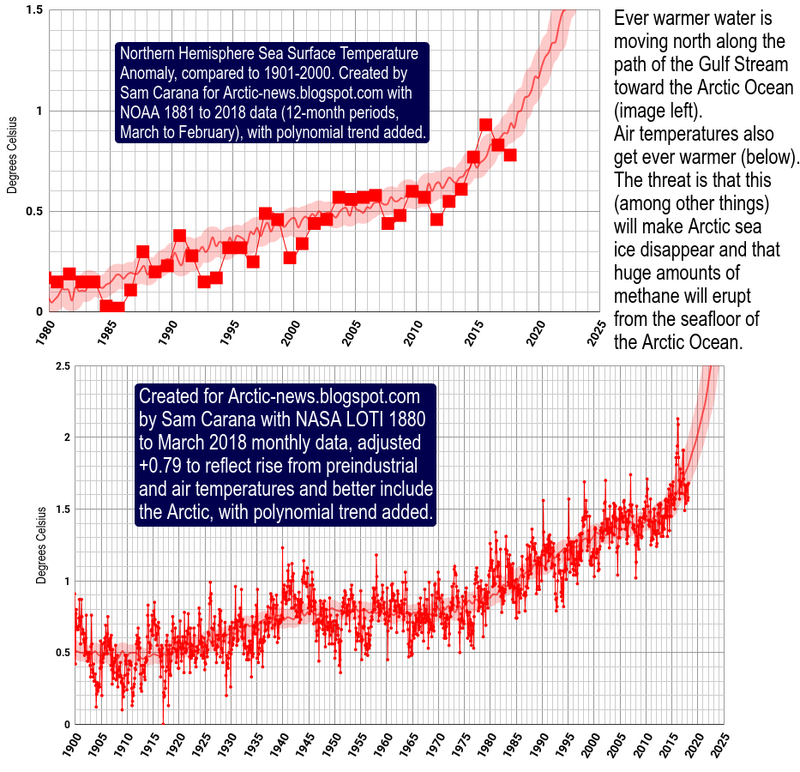 Meanwhile, CO₂ (carbon dioxide) levels are rising. 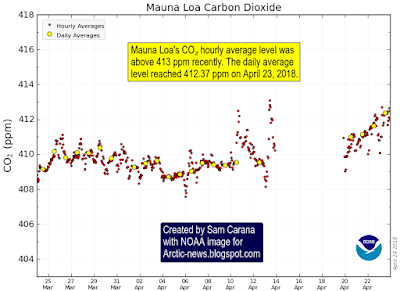 The image on the right shows that Mauna Loa's CO₂ hourly average level was above 413 ppm recently. 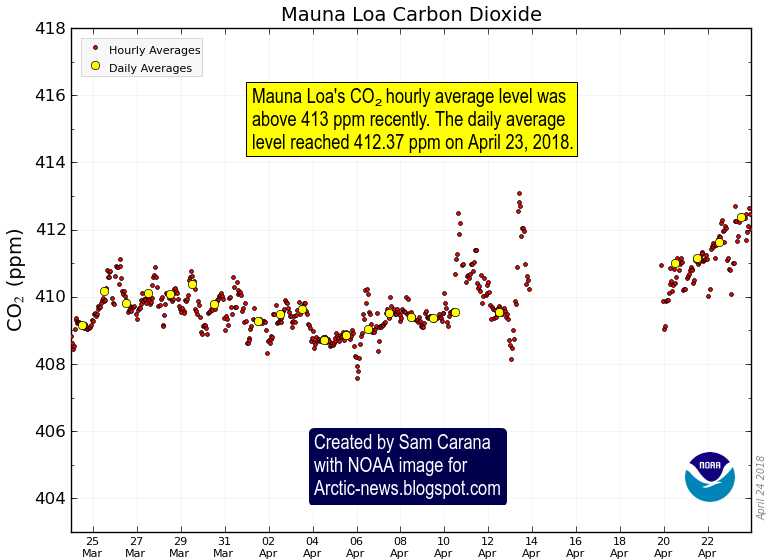 The daily average CO₂ level reached 412.37 ppm on April 23, 2018. 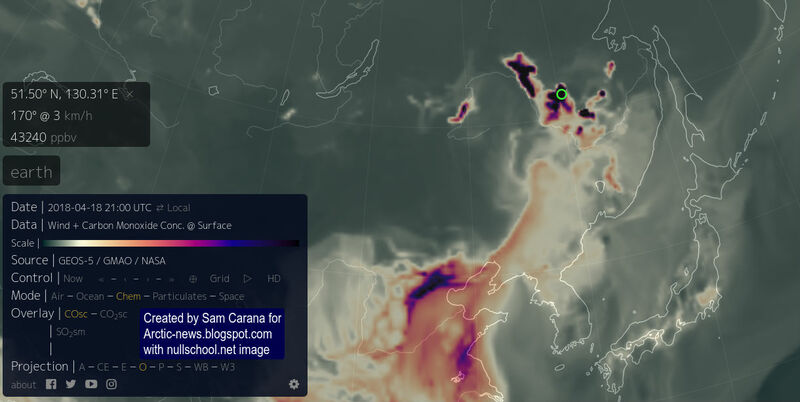 Fires are raging near the Amur River in East Siberia, with associated high emissions, as illustrated by the images below. 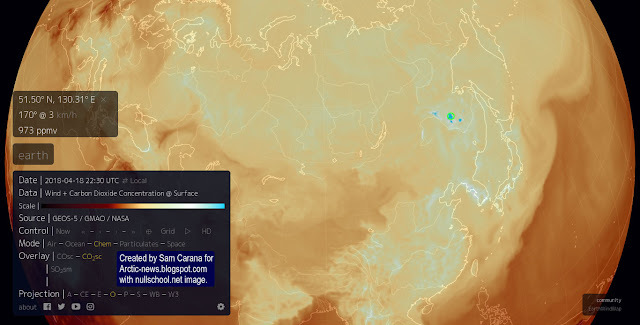 Above image shows CO₂ levels reaching as high as 973 ppm on April 18, 2018. 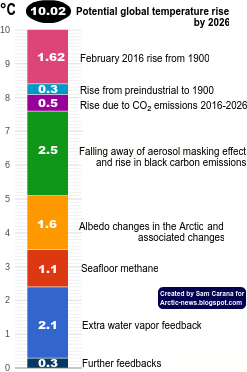 As the image below shows, carbon monoxide levels at that spot were as high as 43,240 ppb on April 18, 2018. The NASA satellite image below shows smoke plumes of the fires and burn scars on April 19, 2018. It's phenomenal to me that the subject of climate change still has millions of people that remain in denial. Are humans beings really that stupid? Wadhams talks about how many of the other countries decided to back off of their commitments due to Trump's position. That's really a sad commentary on US politics, because I still remember driving along and on the radio the news came over that Reagan had just gotten rid of the tax cuts for renewables Carter had put in place, and was removing the solar panels from the roof of the White House. At the time I thought we're going to pay a price in the future because of that decision (which was true and is happening now), without any realization history would repeat itself so many years later with Trump opting out of the Paris Accord. I'm still in shock, but maybe I'm just naïve still after all these years. What is it I don't understand? Well with the billion dollar anti climate science propaganda campaign, paid for by fossil fuel interests,it' know wonder the general public have gone stupid on this issue and out right brainwashed. It does not matter what people think. Democracy was hijacked. Capital dictates any colective action. And as always, serves only its own interests. Those interests are directly fueling climate change and our predicament. Stupid are lucky, not to understand it. I envy stupid. Thank you to the contributors, creators and managers of this blog for all the effort put into this site. How much warmer is it now?